Dominican Rum meets Scottish Highlands. The name “Summum” comes from an old Latin Expression which means “the highest good.” If Rum is your thing, then you might agree with that and the Summum Rum master Juan Alberto Alvarez has followed this philosophy of absolute excellence, which is evident in their entire line being aged at least 12 years using the Solera method (fractional blending where the end result is a mixture of ages). Summum 12YO Malt Whisky Finish is one of such Rums, but with a wonderful twist. Not only is this Dominican Rum based on old Cuban recipes and aged for dozen years "Solera style" - it is also finished in barrels that previously held Ben Nevis Single Malt Whisky from the Highlands. So, what do you get if you get a Dominican girl and a Scottish lad on a blind date? A rich and sweet relationship with all the tropical spice of a premium Rum and the lingering toffee-malty-peaty flavor of a Highlander. It's a fun mix of centenary formulas of the Dominican Rums and the process of double aging of the prestigious Scottish Whisky. This Solera Rum with Whisky finish is a soft and warm potion with notes of vanilla, plums and caramel. The presence of the malt from the finish is unmistakable and while this bottle is as smooth and mild like the popular Summum Reserva Especial, there's an extra suave fierceness to this treat. “Summum Bonum” translates from ancient Latin at “the highest good.” The phrase was introduced by the Roman orator, lawyer, and philosopher Cicero in the first century AD. His influence on language and literature for the last two thousand years has been immense — some say the equal to Shakespeare. 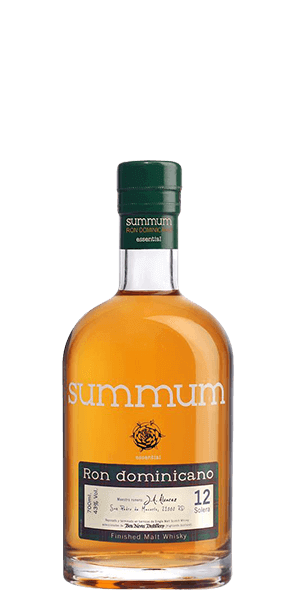 What does Summum Solera 12 Ben Nevis Whisky Cask Finish Rum taste like? The Flavor Spiral™ shows the most common flavors that you'll taste in Summum Solera 12 Ben Nevis Whisky Cask Finish Rum and gives you a chance to have a taste of it before actually tasting it. Malt Whisky aroma with a hint of toffee. Light-bodied with chocolate with peated malt and Luxardo cherry. Medium length with a bite at the end. This was absolutely fantastic. Perfect for sipping or mixing. I have a few cigars in mind for this, when I can get my hands on a full bottle. Beautiful, complex rum. So smooth and delicious. A perfect fusion of Scotch and rum. This so far is my favorite rum I’ve tried. Very smooth. No mixers whatsoever. A little harsh. Strong Caramel flavor with a definite spicy kick. Body has smooth malt qualities but alcohol hits you too much. The carmel and toffee notes work really well together. Good as a candied desert style sipper; one of my favorite rums. It was so smooth with hints of vanilla. Great nose. Taste elegant and sweet. Keep a very nice long taste. With a point of honey. It is an outstanding, creamy, Malt Whisky Finish Rum with an aromatic birth, while a delicate & rich life, leads to a death of medium length with a bite. Very nice, a bit of spice and vanilla. Liked it!! Wonderful caramel notes with just a hint of smokiness, pleasant aroma of vanilla and caramel. Would be a perfect addition to any home bar. Its good but too much caramel - that doesn't mix well with the whiskey. Very smooth with a good amount of chocolate and Scotch taste, especially in the finish. This is definitely a Scotch drinker's rum.